How Do I . . . er, Can Thee? With apologies to E. B. Browning: “How do I store [as in ‘preserve’] thee? Let me count the ways. I store thee to the depth and breadth and height a Mason jar can reach . . . “ And in other ways. Red, ripe tomatoes, the essence of summer. How to capture that essence for a dark, snowy winter day? A few ways: Let me count the ways. Canning tomatoes can be a complicated, drawn out process, or something quick and easy. 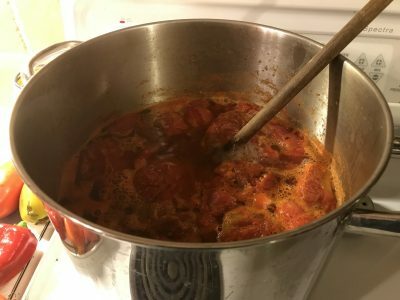 In the heat of summer, I choose the latter, merely filling a large pot a half-inch of water and then whole tomatoes from which any diseased or unripened areas have been excised. No de-skinning, de-seeding, or chopping. The pot is allowed to cool a bit after its volume has been reduced to one-half to two-thirds of the original volume. King Tut is alive and well, very well in fact. 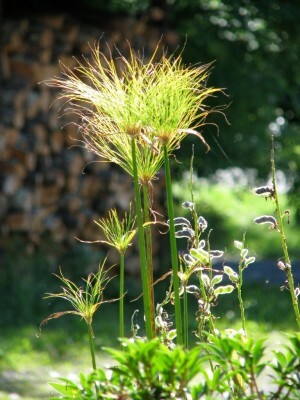 I’ll cut to the chase: This particular King Tut is a variety of papyrus (Cyperus papyrus) that I planted a year ago in spring. Papyrus doesn’t tolerate temperatures down to freezing, so this far north King Tut is billed as an annual. But rather than let the King die in winter, I was so smitten by him that in autumn I moved him in his pot indoors to a sunny window. There he clung to life and, with warm, sunny weather, got growing again this past spring. Row, Row, Row My Boat, and Then! 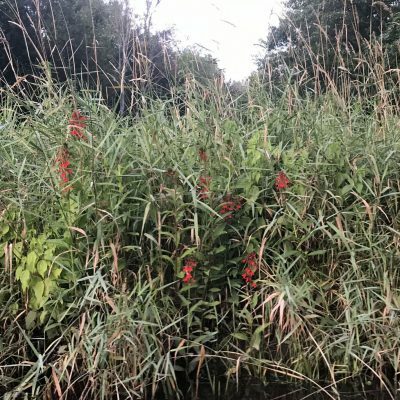 Paddling down a creek — Black Creek in Ulster County, New York — yesterday evening, I was again awed at Mother Nature’s skillful hand with plants. The narrow channel through high grasses bordered along water’s edge was pretty enough. The visual transition from spiky grasses to the placid water surface was softened by pickerelweeds’ (Pontederia cordata) wider foliage up through which rose stalks of blue flowers. Where the channel broadened, flat, green pads of yellow water lotus (Nelumbo lutea) floated on the surface. Night’s approach closed the blossoms, held above the pads on half-foot high stalks, but the flowers’ buttery yellow petals still managed to peek out. Soon I came upon the real show, as far as I was concerned: fire engine red blossoms of cardinal flower (Lobelia cardinalis). Coming upon this flower in the wild is startling. Such a red flower in such shade? 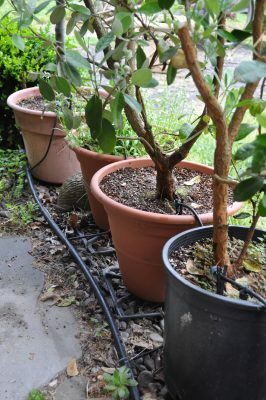 Watering — in the Rain? With recent rains of more than 3 inches over the last couple of days, you’d think that the last thing on my mind would be having to water anything. But you’d be wrong. Plants in pots — and I have plenty of them, some ornamental and some tropical and subtropical fruits — don’t get the full benefit of all that water. Potting soils are, and should be, more porous than any garden soil to maintain good aeration within the confines of a pot. About a one inch depth of water is needed if you’re going to thoroughly wet a 12 inch high column of potting soil. If a flower pot is, for example, only 6 inches high, only 1/2 inch depth of water would be needed; and so on. 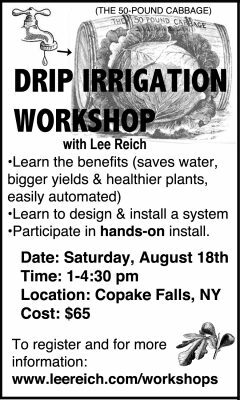 Come and explore the theory and the practice behind the pruning and orienting of branches to create an espalier. This decorative form offers high yields of high quality fruit on a plant or plants that can be free-standing, decorating a wall or fence, or even creating the fence itself! Learn which fruit plants work best and the techniques to create and maintain an espalier. Before the black currant (Ribes nigrum) season totally winds down, I suggest you try to get a taste of the fresh berries. Do so if you’ve never tasted them. And do so even if you have tasted them and found them bad tasting. Why taste them if you haven’t? Because if you end up liking them, they’re easy to grow and nutritious — super-rich in vitamin C (2 to 3 times as much as oranges) and other goodies. Deer don’t particularly like the very aromatic stems and leaves, and birds — even my ducks — ignore the berries. 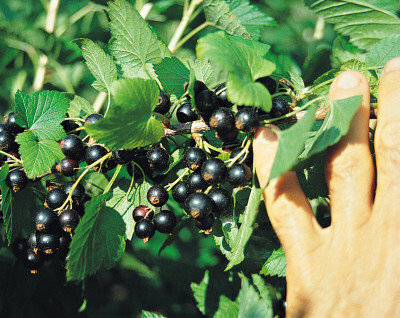 They are among the few berries that thrive and bear well even in some shade. They have few insect or disease problems.